In 1994, when I was a young student and I created the first ALPRA DESIGN calendar, I did not think that a quarter of a century later I would be writing this text. 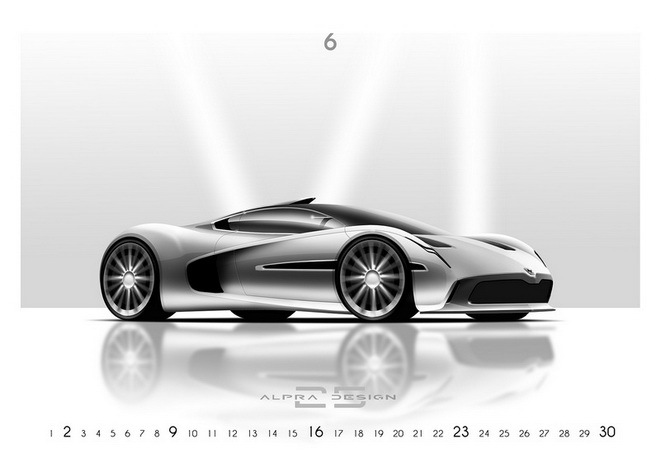 The current jubilee calendar ALPRA DESIGN marks the first 25 years of growth and progress, and of efforts to attract loyal collectors who love cars, art and aesthetics. 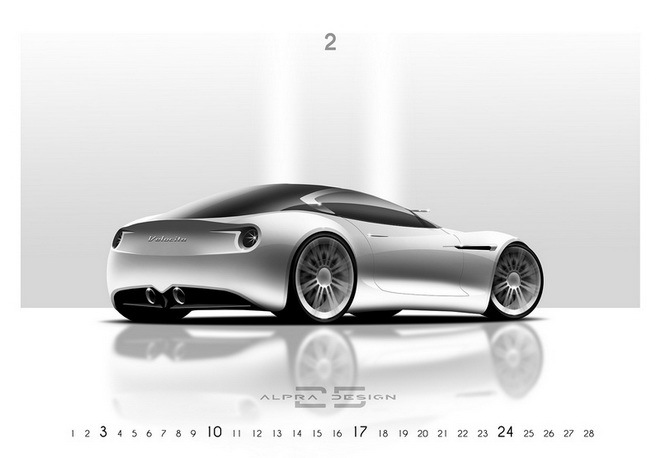 Since its inception, the ALPRA DESIGN calendar has remained loyal to the globally unique theme of displaying a neutral automotive design. However, the car as such has changed considerably throughout history. Today it is saturated internally with abundance of functions, information and accessories, and on the outside with fractures, creases, slits and ornaments. At the same time, it is losing its former meaning and is becoming a digitized moving accommodation space. In the final phase, it will obviously become a self-moving object and will reach a true meaning of the word "automobile". 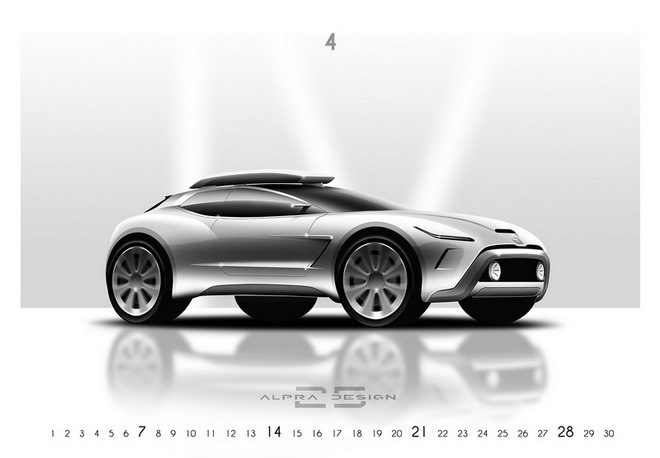 ALPRA DESIGN calendars represent a passion for cars as well as joy of driving and love for design. That is why this edition is not an "explosion" of digital effects and colours, but shows, in a simple and aesthetical manner, vehicles that look like cars, not traveling computers. Their shapes combine the curves and edges into a harmonious whole, without excesses. This purity is also reflected in bright colours that highlight the car and give it some "breathing" space. The lines in the background represent stylized Roman numbers of individual months of the year - a reminder of the past, which is almost forgotten, as will probably be the case for modern cars. First ALPRA DESIGN calendar was published in 1994 by ČZP Voranc (publisher). Since their first year calendars ALPRA DESIGN maintained a unique theme - neutral transportation design. During the years, they became calendars for collectors. 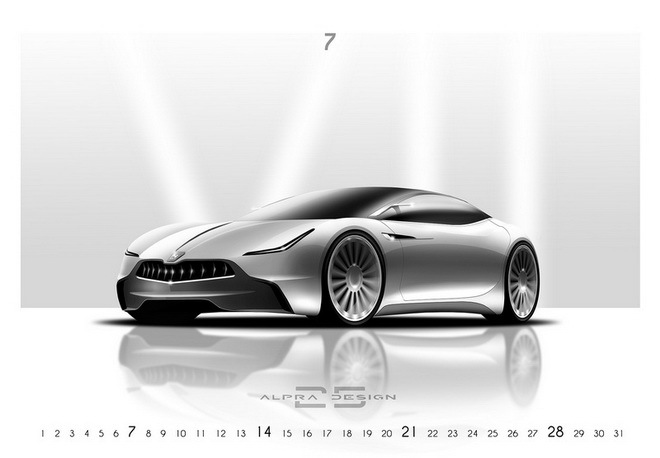 Each and every year calendars show different design approach. Therefore their regular customers always look forward to be surprised by new editions. REVIEWS - Buyers know why they buy ALPRA DESIGN! "Passion, sophistication, exclusivity, unobtrusive appearance that leaves a deep impression. I give these calendars to selected persons who also have such qualities!" Suzana Filipancic, Vice President of Corporate Development, GRAMMER AG. "I purchase the ALPRA DESIGN calendar every year, because I support this high-quality design product, instead of wasting money for a pile of worthless New Year gifts, as is customary." Irena Hlede, architect, designer, journalist and executive director of the Slovenian Association for Sustainable Building. "The ALPRA DESIGN calendar is unique and visionary, but at the same time it is very close to us, because it is created from the visions of our nearby Slovenian designer. These visions inspire us that we can also create and achieve our own visions in our work. And although calendars are often a gift for the New Year, this one is so special and exclusive that almost all of the copies given toour business partners, together with personal dedication, occupy an honorable place on the walls of their offices or at home." Vladimir Pogac, CEO, TURNA production and trade d.o.o. "We have been giving the ALPRA DESIGN calendars to our special partners for many years, because they are distinguished by uniqueness. Low-volume is just an extra plus to stay faithful." Maja Spanzel, Head of Marketing, TAB d.d. "This is not an ordinary calendar. Because: when you first see it and scroll through it, it strikes you and freezes you. It isfascinating! And it's not for everyone. This calendar is for people who need feast for the eyes. Like me." Irma Gnamus, CEO, ORFIS d.o.o. 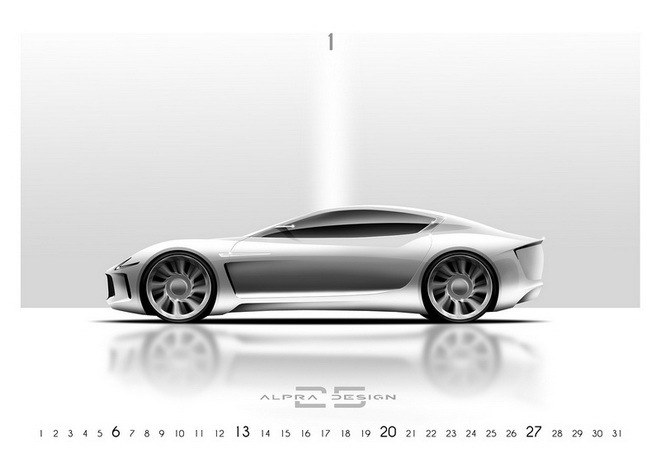 Calendars ALPRA DESIGN are exclusive calendars. They combine aesthetics, art of drawing, technical knowledge and designers skills. Their size, print quality and most of all - an exotic theme - place them among rare calendars. Calendar ALPRA DESIGN 2019 is designed for international use. It is printed on a quality paper (49 x 34 centimeters) and enhanced with a silver logo. 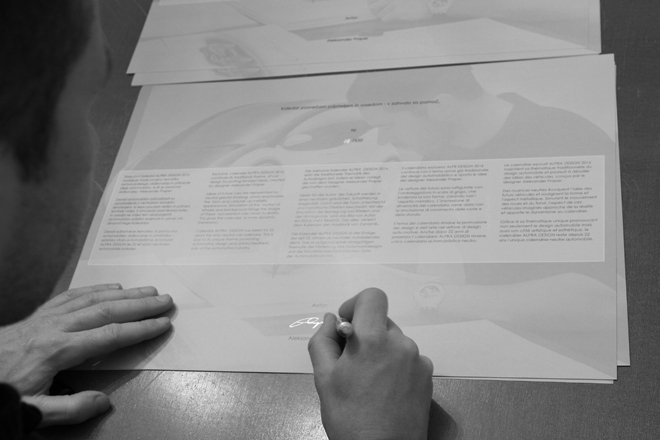 Each copy of the calendar is numbered and signed and finally inserted together with four postcards in a cardboard box. 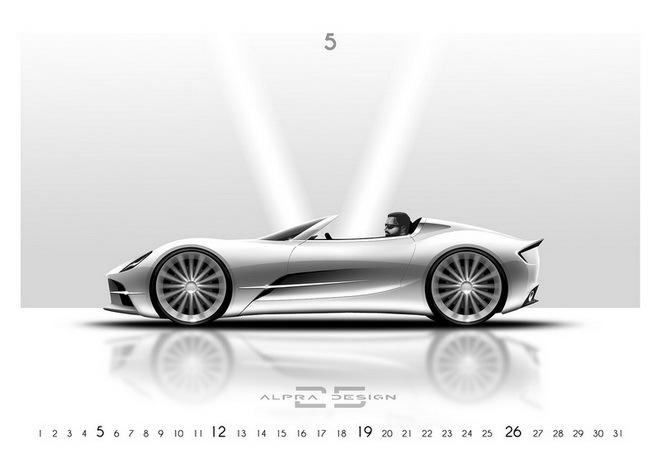 Each copy of the ALPRA DESIGN calendar from limited edition is signed and numbered. 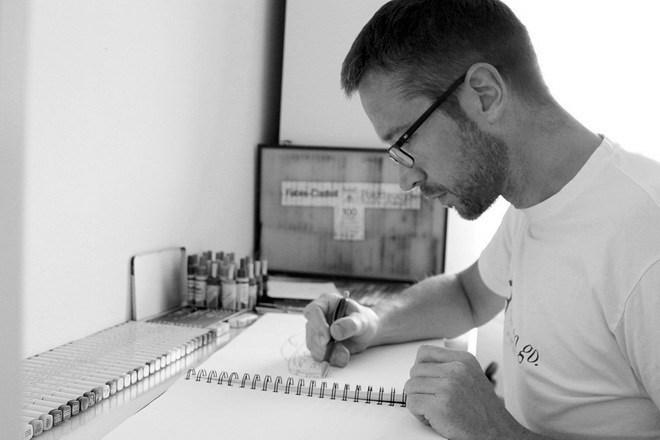 Author of ideas, drawings and graphic design is Aleksander Praper. Mr. Praper is a mechanical engineer, designer and an automotive journalist. Combining technical, aesthetic and practical knowledge, he has a good sense of what good car looks like and the way it works. All that knowledge can be sensed in his designs, which combine classic aesthetic and a great amount of love toward a genuine sports car. Therefore his designs look like cars, not like unfeasible toys from the future.